This picture was constructed from measurements that were made on 21 September 1996 on SOHO with the Solar Ultraviolet Measurements of Emitted Radiation spectrometer (SUMER) providing Doppler spectroscopy of the coronal plasma, with the Michelson Doppler Imager (MDI) delivering magnetograms of the solar photosphere, and the Extreme ultraviolet Imaging Telescope (EIT) giving the context image of the Sun in the left corner. The SUMER spectrometer analyses ultraviolet light which is emitted by the hot gas in the Sun's atmosphere, and is ideally suited for studying atmospheric motions. 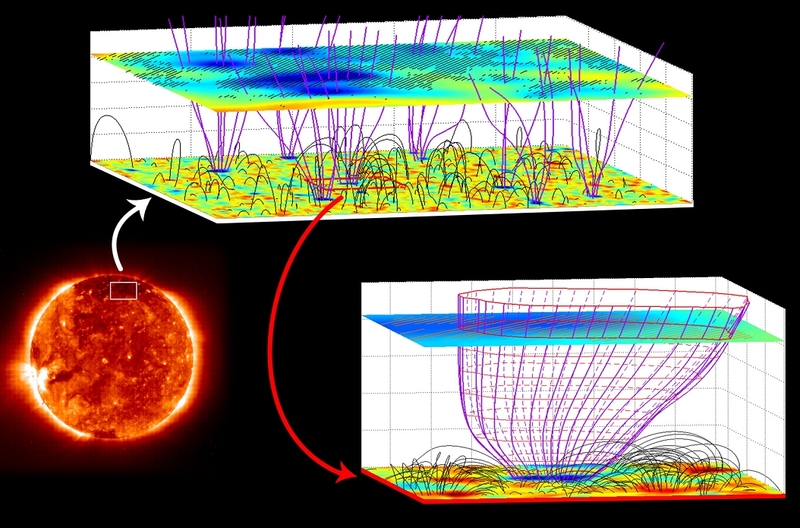 However, a careful data analysis, involving subtle wavelength calibration and coronal magnetic-field extrapolation, was required before the slow outward motions could be identified at various heights above the solar surface, and their links with the magnetic field guiding the flow be established. 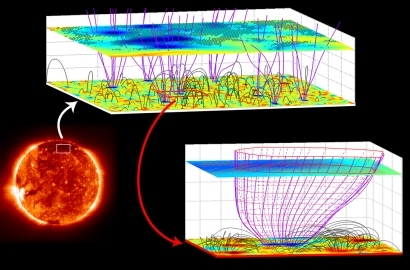 The figure illustrates the location and geometry of three-dimensional magnetic field structures in the solar atmosphere. The magenta coloured curves illustrate open field lines, and the dark grey solid arches show closed ones. In the lower plane the magnetic field vertical component obtained at the photosphere by MDI is shown. In the upper plane inserted at 20 600 km we compare the Ne VIII Doppler shift with the model field. The hatched area indicates where the outflow speed of highly charged neon ions is larger than 7 kms-1. Note the funnel constriction by pushing and crowding of neighbouring loops. The scale of the upper figure is stretched quite a lot in the vertical direction. The smaller figure in the lower right corner shows a single magnetic funnel, with the same scale in both vertical and horizontal directions. See also the related publication in the 22 April 2005 issue of SCIENCE magazine, linked from the right-hand navigation.